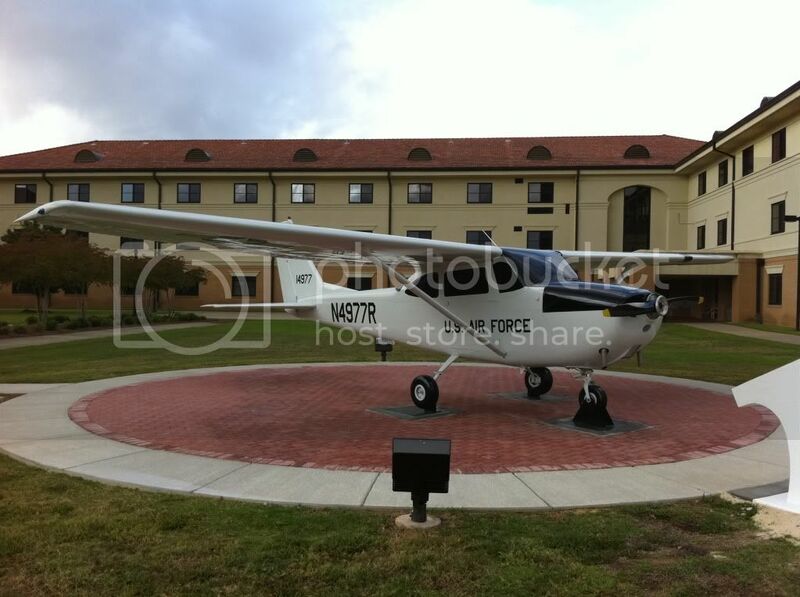 This T-41 was placed on static display in 2010 in the courtyard of some OTS dorms. I'm not a big fan of outdoor statics, but this one's okay by me. I logged some time in this bird as a young CFI. Remembering my time from OTS. they kept some T-41s at Hondo for screening of OT's slated for UPT. IIRC, those OTs spent some time in the Cessnas before going through the 12 week OTS. In a related story, I recall a big/tall guy from my class being pulled out of class for a day, they took him to Randolph to make sure he'd fit in a T-37. Just wondering why there's a civilian registration number on an Air Force aircraft? 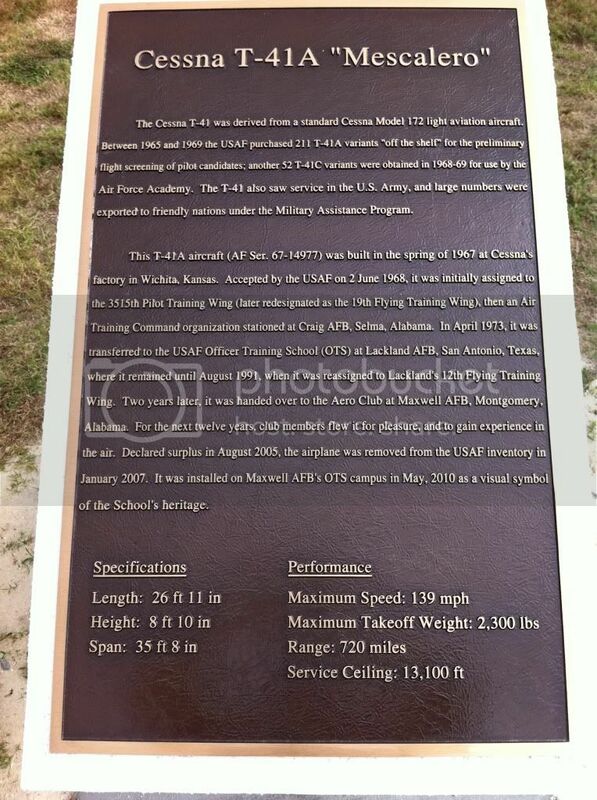 I'm pretty sure it has to do with being transferred to the Maxwell Aero Club, which is a civilian organization. It was no longer Air Force property, so it had to be registered as a civilian aircraft. The registration was cancelled in 2008, after it was withdrawn from Aero Club use. If God had intended airplane engines to have horizontally-opposed cylinders, Pratt & Whitney would have built them that way. So who stole the spinner? All USAF T-41As & Cs were marked with N numbers and USAF Serials....probably because many (most?) 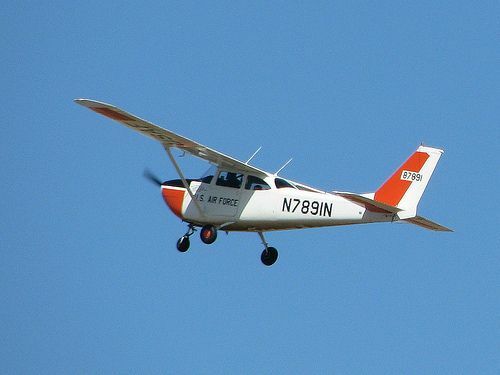 were used by civil contract flying schools for intial grading of UPT candidates.... possibly, it was for something as simple to ease radio calls (The Cs were 210hp variants used by the AF Academy...extra power for the Colorado altitudes). The N numbers coincided with the last four digits of the USAF serial followed by a letter...many had "F", this one has "R". The photo I have of a "C" shows a "N" suffix. she looks MINT! good for those folks for such a fine display. thanks for the pics. I just HAVE to ask, are any of these on the warbird circuit? I'm surprised there aren't more. Many were used by Flying Clubs and perhaps the CAP, so they should still be out there. I wonder if any are just registered as 172s? I really like the Army scheme. IIRC, if you watch the film The Green Berets, you see one with day-go in the background of a stateside airport scene. 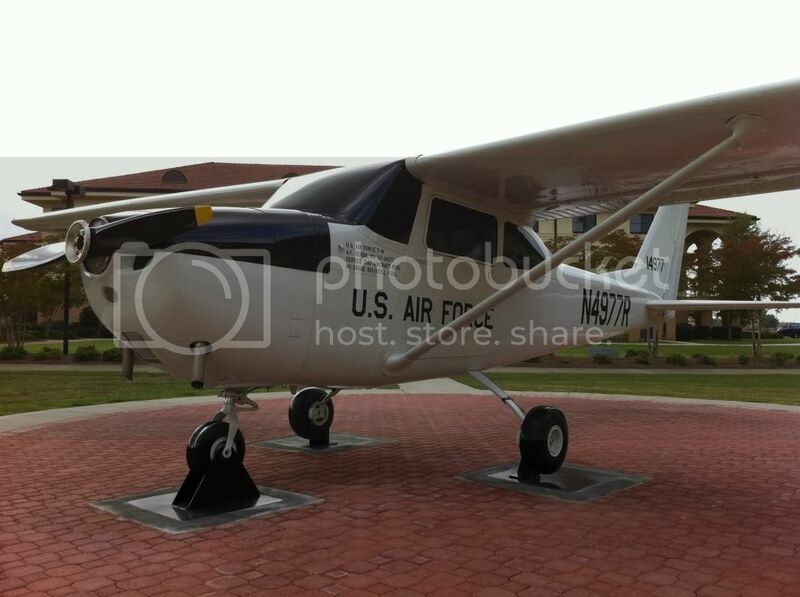 There are a bunch more out there, they are just registered as C-172's. I looked at buying one but they all had over 10,000 flight hours on them. A little more flight time than my comfort level. 9,000 to 12,000 is typical for most surplus L-19s. I restored three with those kind of times and they were fine as long as you go thru them and replace any worn components. You do need to check for small stress cracks in the upper wing skins near rivets. The best part of buying one is the full chromate corrosion proofing, the biggest problem on old air frames is not high time, it is corrosion. The advantage of buying a high time aircraft from a Flying Club is that most have had very good maintenance. 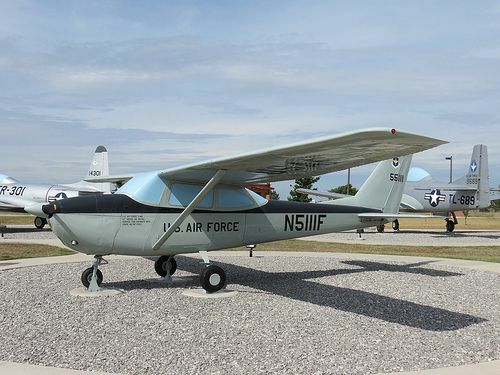 The problem in obtaining either a T-41A or B is most are still owned by the Government and when released by the Club they cannot be sold and are sent to Davis Mothan. Aircraft that went to States and other agencies have made their way in to private hands and can be bought. Another issue is that the majority of the Army T-41B aircraft had their 210 HP engines removed and replaced with 180 HP Lycomings when they went to the CAP. It is rare to find an original T-41B with the IO-360 210 HP engine. 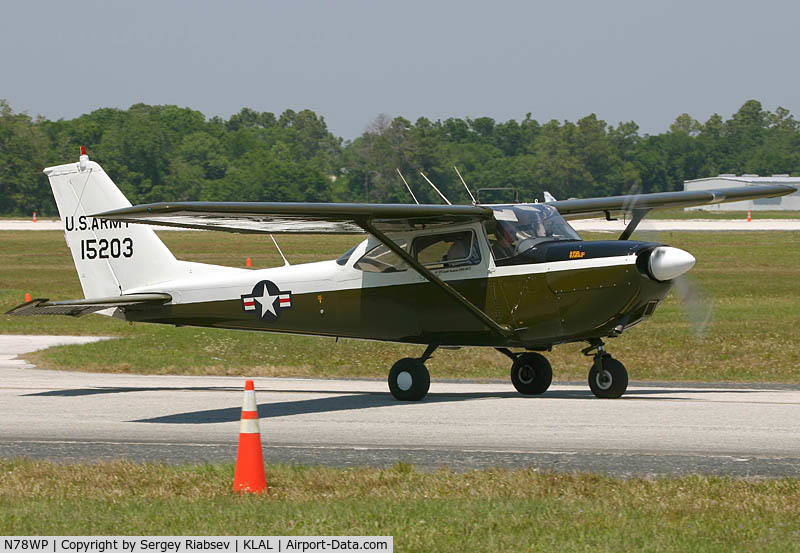 A lot of pilots that saw service in Vietnam learned how to fly in A and B model T-41s. Many years ago, Flying magazine had a piece on Cessnas with high airframe hours. The general point was "No big deal". I think Cessna recommended replacing the wing attach bolts. Look in Trade-A-Plane, plenty of ex-trainers and pipeline patrol aircraft with much more than 10,000 hours. Obviously, do a good inspection, but high hours, in of itself, should not scare you away from a simple, unpressurized Cessna. As L4pilot said, corrosion is the bigger issue. Mine is only 2 serial numbers off that airplane. Last edited by turninggrey on Sun Sep 13, 2015 4:26 pm, edited 1 time in total.